Learning to ski—as both a child and an adult—is a daunting task. With long waits, terrifying steeps, and the constant notion that you’re a nuisance to everyone else on the trail make for less-than-ideal learning conditions. While some American skiers are immediately thrown into the thick of the sport, learning on big-name resorts like Breckenridge and Stowe, West Virginia skiers have a distinct advantage: most of the state’s resorts are incredibly approachable and accessible to first-timers. Patience is the most important trait for beginning skiers; you must be patient with yourself, learn the techniques, and apply them only when you’re ready. Learning to ski at a large mountain resort can be a fulfilling experience, but it adds pressure and stress to an already tense situation. Beginners need to take their time going down the mountain—they shouldn’t feel rushed by advanced shredders tearing down the same trail. Similarly, beginners should spend as much time as they can on the actual mountain—not waiting for hours in a lift line. Learning to ski at a West Virginia ski resort eliminates external stressors, allowing first-time skiers to fully appreciate all that skiing has to offer. 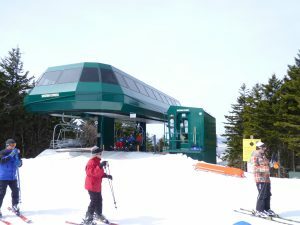 West Virginia ski resorts also offer lower gradients, allowing beginners to experience most of a mountain without needing to master complex techniques. Of course, there are a few exceptions—Snowshoe Mountain has 1,500 feet of vertical and the steepest run in the region—but much of West Virginia’s skiing terrain is beginner friendly. If you’re just starting out, you can rest assured you won’t be on the same bunny slope every day. To that end, West Virginia ski resorts prioritize education and ski instruction. Winterplace, for example, only hires instructors with extensive experience and certification. They have a separated beginner area to ensure safety and comfort, earning the resort the title “Best Place to Learn” from Blue Ridge Outdoors. If you’re a West Virginia resident just learning to ski, consider yourself lucky. These resorts are incredibly friendly to beginners, and you’ll receive the best instruction, experience accessible conditions, and spend all your time on the slopes.